Unemployment dropped to 3.7 percent in September, the lowest rate since December 1969. The U.S. successfully landed astronauts on the moon several times from July 1969 to December 1972. 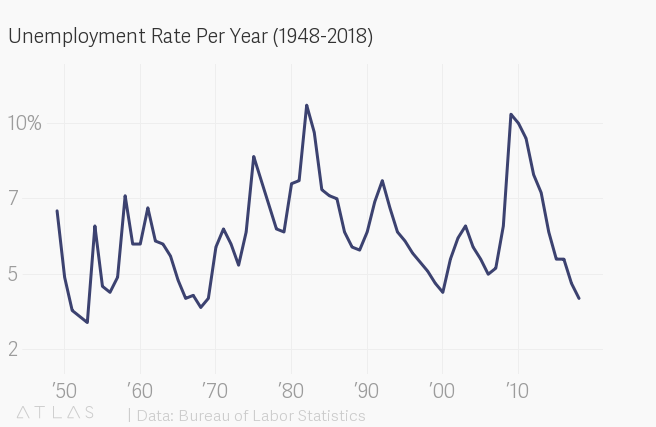 The unemployment rate for black Americans declined to 6 percent, the second-lowest it has been since BLS began tracking in 1972. The lowest was in May when it fell to 5.9 percent. The Hispanic unemployment rate also dropped to 4.5 percent, tying July for the lowest on record. The last time the unemployment rate was this low nationally was December 1969 when it hit 3.5 percent. During this time, the National Aeronautics and Space Administration was engaged in its Apollo program, which put American astronauts on the moon. In July 1969, Apollo 11 landed on the moon, with astronauts Neil Armstrong and Edwin “Buzz” Aldrin being the first humans to walk on its surface. The last manned mission to the moon was in December 1972. The Congressional Budget Office predicts that the unemployment rate will drop to 3.4 percent in 2019.